Manchester United utility player Daley Bind reportedly remains a wanted man ahead of the January transfer window next month, with Barcelona still rumoured to be interested in securing the Dutch star, as well as Serie A title contenders Inter Milan also now apparently in the hunt. 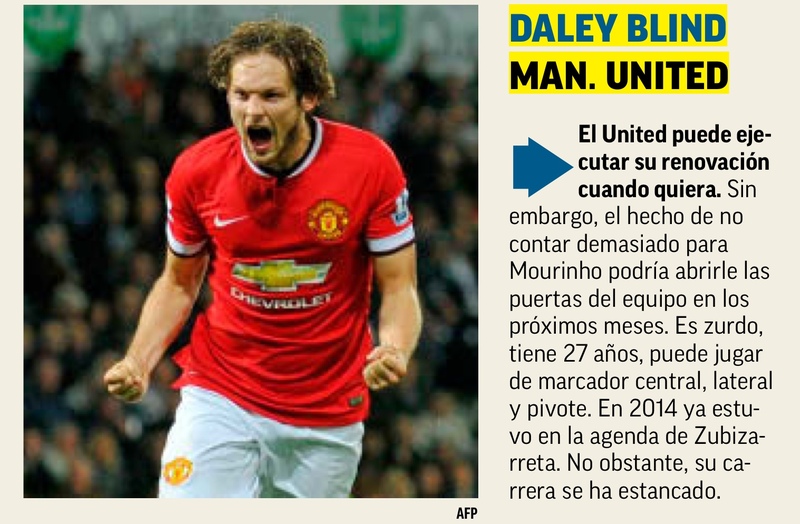 Blind was first linked with Barcelona way back in 2014, just prior to his move to Old Trafford from Ajax, but gossip about a potential new approach from Camp Nou surfaced earlier this month in a report from Spanish publication Marca. It has been suggested than an expected exit for Javier Mascherano, possibly to China or maybe back home to Argentina, combined with the injury to Samuel Umtiti, has left Barça looking for extra defensive cover in January and Blind appears to fit the brief. A report from CalcioMercato has now since also declared that Inter are keeping an eye on the 27-year-old, claiming that both they and Barça are seeking a cut-price deal in the coming weeks in light of Blind's expiring contract at United. The 27-year-old has shown his ability to operate as a left-back, left wing-back, centre-back and defensive midfielder during his career to date and would offer either Barça or Inter plenty of new options should either be able to complete a deal. From being one of the first names on the teamsheet under the management of fellow countryman Louis van Gaal, Blind has badly fallen down the pecking order since Jose Mourinho arrived at Old Trafford last year - Ashley Young and Luke Shaw are currently ahead of him. Oddly, Blind hasn't missed a single minute of Champions League football so far this season, but he hasn't started a Premier League game since August and hasn't even been selected on the bench for five of the last seven domestic fixtures. It must also be highlighted that while Barça and Inter are seemingly seeking a cut-price January deal or as a free agent in summer, United still retain a 12-month extension clause that they are expected to trigger. That will stabilise his dropping value and ensure he cannot leave for nothing.